Stow Station near to Stow Primary School. Scotland’s transport agency says the future timetable of the Borders Railway as it affects the village of Stow will be kept “under review”. Transport Scotland was responding after concerns were expressed that almost a third of services on the new line, due to open to the public on September 6, will not stop in Stow. The platform for this disquiet was Monday’s meeting of Stow Community Council. On weekdays, nine of the 33 trains leaving Edinburgh will go straight through the village, including the first journey which leaves Waverley at 5.43am. Of the trains from Tweedbank, 10 will not stop at the new station, including the 5.59am commuter service. On Saturdays, 13 northbound and 10 southbound trains will go through Stow without stopping. 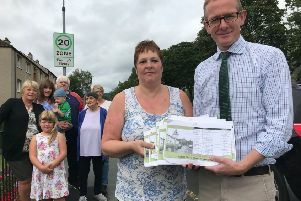 Community councillors resolved to write to Transport Scotland and operator Abellio demanding to know why the village is being treated differently to the eight other stations on the 35-mile route between Edinburgh and Tweedbank. Rail bosses will also be asked to monitor passenger figures to and from the village when considering future timetable changes. “Much of the strength of feeling comes from the fact that people in this valley had to fight long and hard to have a stop at Stow included in the legislation which gave us the railway,” said Mr Aitchison after the meeting. A spokesperson from Transport Scotland said: “As with the vast majority of the rail network, the Borders Railway will have some services with a reduced number of stops to provide faster journeys. These take into account the projected demand at individual stations, together with the journey time savings, to maximise the benefits of the railway. “The majority of services will stop at Stow and this will be kept under review as future timetables are developed.